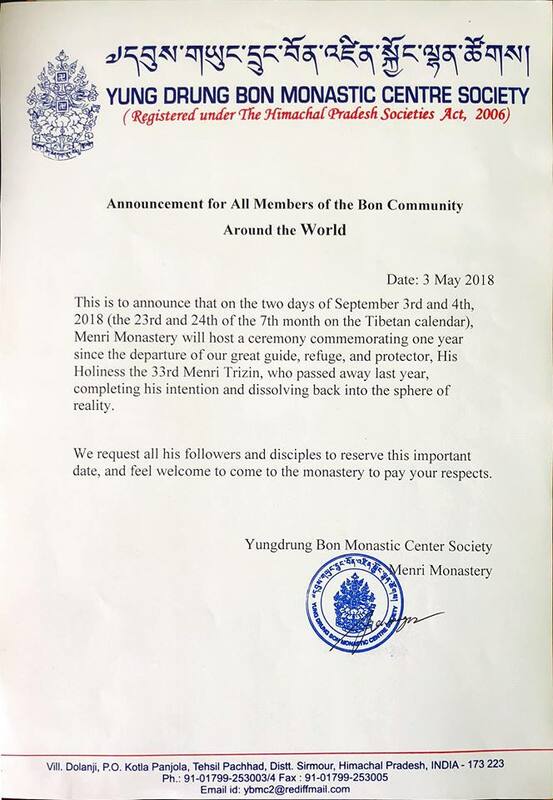 This is to announce that on the two days of September 3rd and 4th, 2018 (the 23rd and 24th of the 7th month on the Tibetan calendar), Menri Monastery will host a ceremony commemorating one year since the departure of our great guide, refuge, and protector, His Holiness the 33rd Menri Trizin, who passed away last year, completing his intention and dissolving back into the sphere of reality. 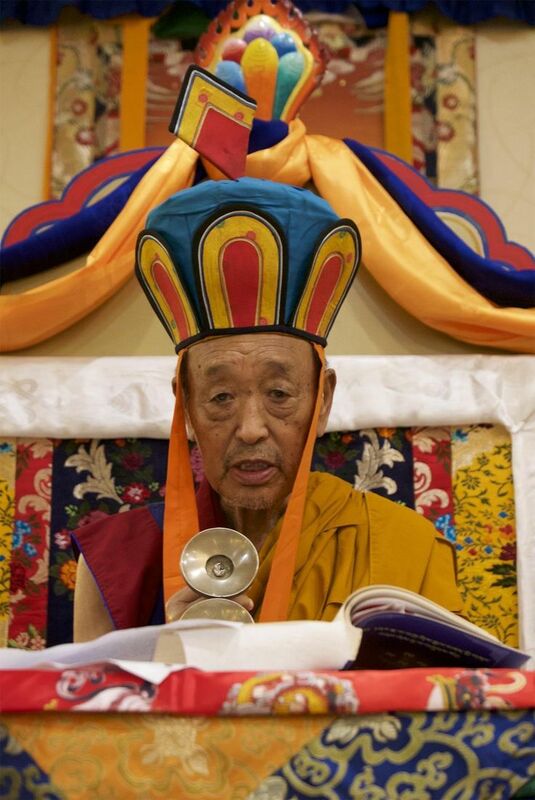 His Holiness Lungtok Tenpai Nyima Rinpoche, the 33rd Menri Trizin and the spiritual leader of Yungdrung Bön passed away at the age of 90, after he entered the meditative state of thukdam at his residence in the Menri Monastery, Dolanji, India, on September 14th, 2017. 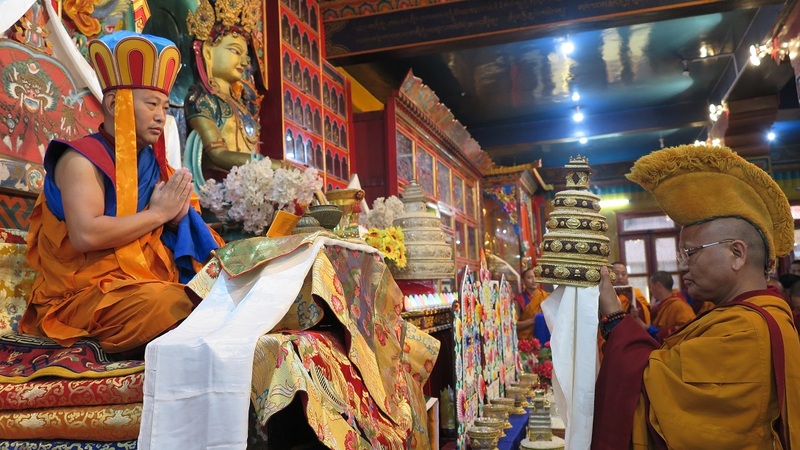 On September 18th, 2017, five days after the ending of His Holiness’s state of thukdam, prayer services — including one by the Tibetan government in exile — were held across the world and numerous rituals were conducted by the monastic community including tsok offerings. The Menri Monastery was also open for public visits from September 16 through October 2nd to view His Holiness and receive blessings. 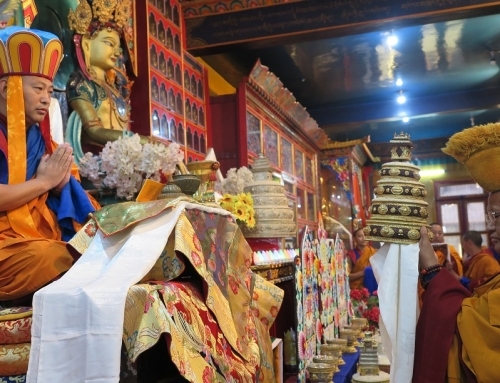 On October 2nd, the sacred physical remains of His Holiness were cremated in an elaborate ceremony at the Menri Monastery, following a five days long fire offering ritual. The cremation ceremony and all the conducted rituals presented a very auspicious opportunity for the Yungdrung Bön community to receive blessings, generating great benefit for all sentient beings. November 4th, 2017 marked the 49th day of His Holiness’s passing into liberation which, presented another very special opportunity and time to connect with His Holiness, and receive his blessings.